Lots of happy customers are enjoying great water every day with a WATERBOY system. You can too! Our best asset is our customers– thousands of satisfied customers who have made the change to fresh, clean great tasting water with their WATERBOY™ system. For them, poor taste, odors, the feeling of “can’t rinse off the soap”, damaging mineral deposits in pipes and appliances are all things of the past. 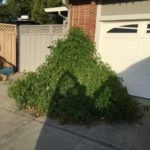 “Last February I purchased a Waterboy 3000 and had it installed at my house in Pleasanton… All summer, the plant grew to immense proportions to the point we were referring to it as the “Green Monster”. It continued to grow and put out a tremendous crop of fruit well into early November! It only stopped with the first frost and I finally had to remove it today. The only reason I can think of for this unusual productivity and longevity is the consistent watering using the backflush. Pleasanton is known for its mineral laden water and the backflush must be heavily concentrated with these minerals. Although the “Green Monster” limited access to the garage, I plan to replant another tomato next year and hope to get the same results.